My theory about why we need mindfulness is that it is related to be “connected” continuously. Our brains can become overworked from all the stimulation we get from various sources, such as computer, TV, internet, and smartphone. We are 100% connected. We rarely get a break and when we do, we are wondering what we are missing! When we overwork our brains for so long, they cannot slow down. Therefore, we need to train ourselves to slow our brains down by being more mindful. The Language of Mindfulness involves compassion. Instead of saying “I should” or “I shouldn’t eat that”, we need to be more curious and consider “Am I eating mindfully?” Allow ourselves to be more accepting and less critical to making choices. 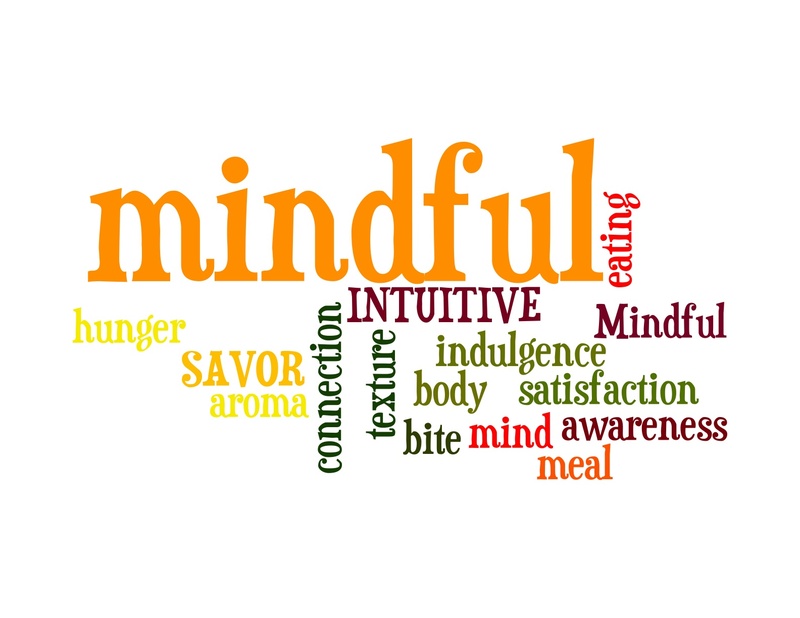 Eating Mindfully – How? Follow the 4 S’s: 1. Sit down to have better focus and experience. 2. Shift into the moment – try not to think ahead or in the past, be in the moment 3. Senses – use smell, taste, texture to enjoy the food. 4. Savour and eat slowing. Set an intentional pace while you eat. Avoid racing through eating. I – Inside: be aware of your thoughts and feelings while you are eating. How do you feel? O – Outside: What is around you in the external environment? How does it affect you? U – You: Be mindful of inside and outside and take the appropriate action for you. Where are you? What are you doing? How are you feeling in this moment? Who is with you? What do you want to eat? All of these tips and ideas come from Dr. Albers books and videos. I found these particular ideas to be helpful for myself for eating more mindfully but also related to other aspects of life. For example, when I am considering other aspects of staying healthy, such as going to the gym, I need to use similar ideas to use more compassionate language when I am not doing what I want to do. I need to work on not thinking only in black and white and allow the grey.